This holiday season, OPI celebrates the 50th Anniversary of a fellow world icon – James Bond – appearing in Skyfall. Starring Daniel Craig and Javier Bardem, this highly-anticipated twenty-third installment opens in theaters nationwide on November 9, 2012. 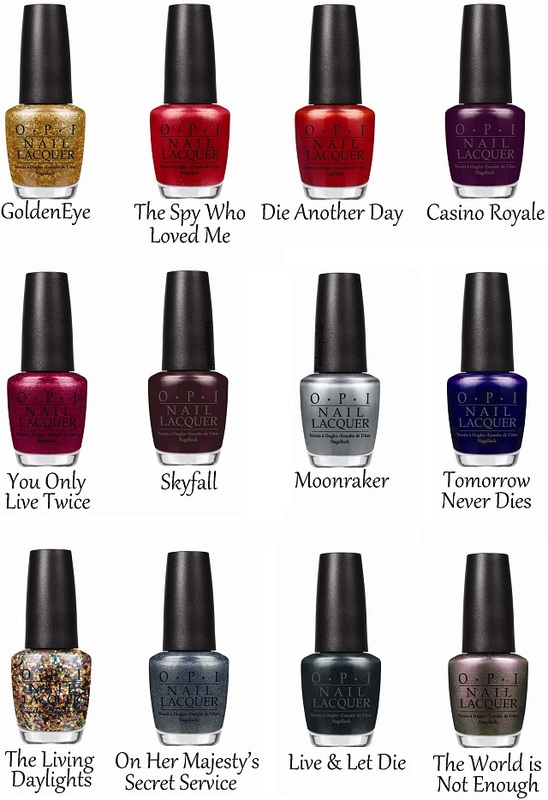 Inspired by the film’s blend of glamour and danger, OPI launches Skyfall Collection, featuring twelve limited-edition nail lacquers for Holiday 2012. “OPI is thrilled to work with EON Productions to celebrate 50 years of the style, swagger and mystique associated with Bond 007,” said Suzi Weiss-Fischmann, OPI Executive VP & Artistic Director. “From metallic and glitter finishes to jewel tones and even a jet black, these lacquers capture the film’s sophisticated and glamorous look. GoldenEye : All eyes will be upon you when you wear this glorious gold. The Spy Who Loved Me : A red as romantic as the secret agent inside you. Die Another Day : Live in the moment in this hot and lively red. Casino Royale : This high-rolling plum is fit for royalty. You Only Live Twice : This rich high-shimmer magenta is a once-in-a-lifetime find. Skyfall : Get Bonded with this magnificent maroon. Moonraker : Drive your fastest car to get this exhilarating metallic grey. Tomorrow Never Dies : This eternally intense purple will live forever. The Living Daylights : This courageous multi-hued glitter sparkles 24/007. On Her Majesty’s Secret Service : This misty-green pewter commands attention. Live & Let Die : Burn the candles on both ends in this private jet black. The World is Not Enough : This rosy silver is as addictive as it is beautiful. As with all OPI nail lacquers, these shades inspired by Skyfall contain no DBP, Toluene, or Formaldehyde, and feature OPI’s exclusive ProWide™ Brush for the ultimate in application. This limited edition promotion will be available beginning October 2012 at Professional Salons, including Beauty Brands, Beauty First, Chatters, Dillard’s, JCPenney, Pure Beauty, Regis, Trade Secret, and ULTA, for $8.50 ($9.95 CAN) suggested retail for each Nail Lacquer. For more information, please call 800-341-9999 or visit http://www.opi.com/. Follow OPI on Twitter @OPI_PRODUCTS and become a Facebook fan! As the world leader in the professional nail care industry, OPI is committed to providing high-quality products and services to both salons and their customers, along with a focus on industry safety and innovation. Known for its exceptional formula, fashionable colors and iconic names,OPI’s heavily-pigmented lacquers are super rich, long-lasting and chip-resistant – offering an affordable luxury to consumers.OPI nail lacquer is available in over 200 shades and contains no DBP, Toluene, or Formaldehyde. Each lacquer featuresOPI’s exclusive ProWide™ Brush for the ultimate in application. Currently,OPI is available in over 100 countries and retails a full line of professional items, including nail treatments, finishing products, lotions, manicure/pedicure products, files, tools, gels and acrylics. I've seen swatches of golden eye and it just looks stunning! Tomorrow Never Dies is one of my favourites! These are all beautiful. It's so hard to pick a favorite! holy crap i'm hyperventilating i need to get all these asap!!! I love opi and they've done it again with another beautiful collection!!! Skyfall and the living daylight are my favorite !! !